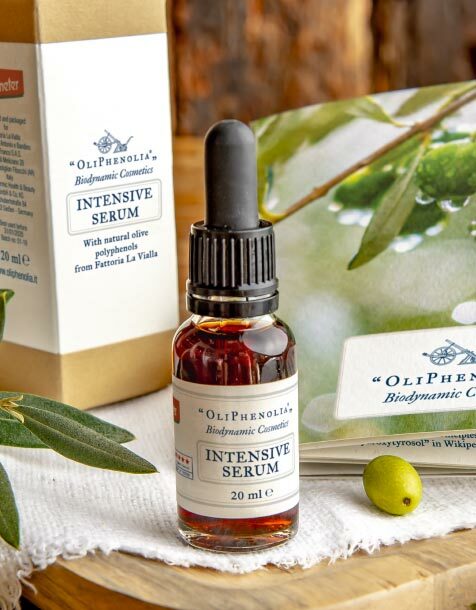 A concentrated formulation of extract of olive vegetation water (OliPhenolia) with an extremely high content of natural polyphenols, especially hydroxytyrosol – powerful antioxidants – and ultrapure fruit water, also obtained from olives, all from biodynamic agriculture and produced at Fattoria La Vialla. Other ingredients worthy of particular mention: firming hyaluronic acid, and moisturising glycerine. Efficient against damage caused by exposure to UVB rays and the harmful effects of free radicals, soothing and decongestant, intensely hydrating, anti-wrinkle, antioxidant, anti-inflammatory, anti-germ and regenerative (anti-age). 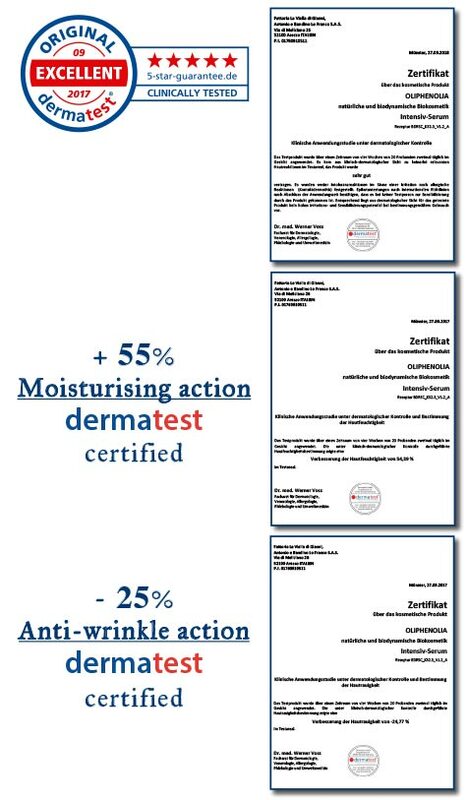 Following tests carried out by dermatest it was awarded the maximum Excellent 5-star seal. RECOMMENDED USE: for a repairing effect and intense moisturising of weary skin, in particular on the face, neck and décolleté. Apply 3 or 4 drops morning and evening on the most needy areas, massaging delicately until completely absorbed. After opening use the Serum within 3 months. DOES NOT CONTAIN parabens, PEGs, phthalates, phenoxyethanol, mineral oils, sodium lauryl sulphate, silicone, substances of animal origin, colouring agents or preservatives (in accordance with the EC Regulation on cosmetic products). Neutral skin pH; 100% natural and biodynamic. Olea Europaea Fruit Water* (89.50%), Olea Europaea Fruit Extract* (OliPhenolia) (1.25%), Pentylene Glycol, Glycerin, Sodium Hyaluronate, Aqua, Sodium Lactate, Lactic Acid. The ingredients marked with an asterisk come from biodynamic agriculture and are produced by Fattoria La Vialla; the others are permitted by Demeter standards. RSC Pharma is a laboratory renowned for its pharmaceutical research and the development of medicines and cosmetics, located in Gießen, Germany. It collaborates with universities and many large German companies and is specialised, in particular, in clinical trials on therapeutic skin care and anti-ageing products. Biodermic Health & Beauty GmbH & Co. KG, located in Gießen, Germany, is renowned for innovative cosmetics. It collaborates with dermatologists, chemists’ and universities, and has received various recognition for its research projects. © 2017 - Fattoria La Vialla di Gianni, Antonio e Bandino S.a.s.